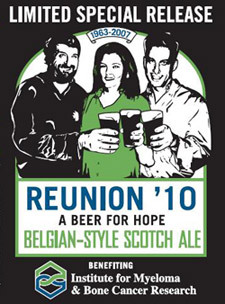 REUNION – A Beer for Hope, now in its fourth year, will be a Belgian-style Scotch Ale for 2010. Bison Brewing in California and Terrapin Beer Company in Georgia are the brewing and fundraising partners. The beer will be released this month in both 22 ounce bottles and draft in 14 states (California, Oregon, Washington, Colorado, Minnesota, Georgia, Florida, South Carolina, North Carolina, Virginia, Tennessee, Alabama New Jersey and Pennsylvania). Information about special events later this month is available at the REUNION website. REUNION Beer is the inspiration and collaboration of Alan Shapiro, president of SBS Imports, Pete Slosberg, creator of Pete’s Wicked AleT, and Virginia MacLean, long time friend and colleague, as a way to raise awareness of and donations for The Institute for Myeloma & Bone Cancer Research. All met during the early days of Pete’s Brewing Company. Virginia passed away from complications from Multiple Myeloma in June 2007, four months after the initial release of REUNION. To date REUNION has raised in excess of $130,000 for The Institute for Myeloma & Bone Cancer Research (www.imbcr.org) via profits from beer sales, retailer fundraising events, and private donations. This year’s beer was developed in concert by brewmasters Spike Buckowski of Terrapin, Dan Del Grande of Bison, and REUNION co-founder Pete Slosberg. It is a Belgian-Style Scotch Ale – a nod to Virginia’s heritage. It is brewed to an original gravity of 1078 using 5 different malts and hopped with East Kent Goldings to 35 IBU. It is fermented with a high gravity Trappist yeast and is 7.0% alcohol by volume. I have had this beer and it is very good. I recommend it.